My father was the first person to tell me about paradoxes of time. He had never heard of Zeno’s, but he was a street philosopher with instinctive wisdom about the world and how it turned. My brother had just received a brand new Schwinn bicycle with chrome fenders, a speedometer and battery-operated horn for his birthday. I still can vividly recall that horn--boy was that cool. My eyes must have betrayed every effort to conceal envy, for my father knew just what I was thinking. To soothe my jealousy, he took me aside and told me that I was half my brother’s age, but in eight years I would be three-quarters his age and that from then on there would hardly be a difference. Of course I had no idea what he meant by three-quarters, let alone three quarters of someone’s age. When I asked how old would I have to be to catch up completely, he laughed and said that that would never happen, but that the difference would always be getting smaller. Twenty-four years later, I thought I understood; but, now, rapidly gaining on my brother as I pass fifteen-sixteenths of his age, I’m just beginning to. The general reading public may have heard one, two or three of Zeno’s paradoxes at some time, but hardly anyone I know has ever heard the fourth. There is good reason why. It is not expressed as well as the others and is often misrepresented because of the difficulty in describing it. Even Aristotle seems to have misunderstood its meaning. It turns out that that fourth paradox has connections to the emergence of calculus, the concept of infinity, the history of time and special relativity. At first thought, it seems that Zeno was simply trying to argue that motion is an illusion, but on thinking further, it becomes clear that there is far more to it. 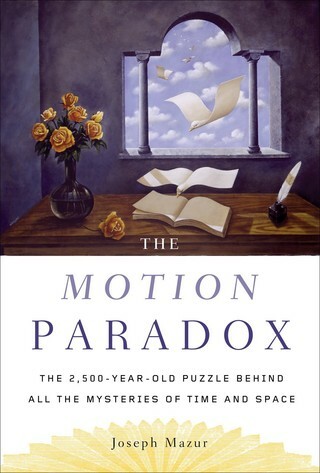 Though this book is about motion in all its forms, the reader will find references to Zeno’s paradoxes throughout. That is because its point weaves a thread through the ages of trying to understand motion, which involves time as well as space. Take the arrow paradox, which suggests that motion is impossible. This is the one where Zeno pictures an arrow in flight and considers time frozen at an instant and argues that the arrow must be stationary at that instant; then, because the instant he chooses to freeze is arbitrary, he claims that the arrow cannot move from the bow. Zeno’s aim seems to call attention to the question of divisibility of time and space and what it means for an object to occupy space, and what that instant is that appears to divide the past from the future. This single paradox may bewilder, but the four together bring a commotion of absurdities, profoundly questioning our models of space, time and continuous motion. Examine that paradox more deeply to find that that divisibility of time and space suggests the whole idea of modern calculus. Zeno's arguments seem absurd. We know the arrow leaves the bow, yet have some difficulty in explaining why or how we know. One may argue that the whole notion of fixing a point in time is absurd and that it makes no sense to say that an arrow appears stationary at any point in time. In mathematics, time is merely a variable that can be fixed by simply declaring it to be some number. We have mathematical formulas that tell us where the arrow is at any time t, so if we let t equal some specific time, then we should know the exact spot where the arrow is at that time. Yet this only makes things more puzzling, for it means that our mathematical models of space, time and motion are merely intellectual constructions built for the convenience of easy calculations, not for strict replication of reality. Today we see the subtlety, but history was not always generous to Zeno inventions. At times during the past two thousand years, his paradoxes were considered simply picky sophisms of logic with little merit for continued discussion. At other times they were considered embarrassments to mathematicians’ investigations of infinity and the continuum; our historians tell us that those paradoxes contributed to the Greek abandonment of such investigations. Today, we are able to construct mathematical models explaining each paradox, but still cannot deconstruct the paradoxes linguistically with intellectual satisfaction. Almost all of what we know about Zeno’s life is speculation, composed from fragments and historical sources written almost a thousand years after his death. We know that he wrote a magnificent book on philosophy that was used as a textbook at Plato’s Academy, but not even the smallest fragment of it has survived. The fifth century philosopher and mathematician Proclus, our principal source of information about the early history of Greek geometry, tells us that Zeno wrote a book containing forty paradoxes, but that it was stolen before it could be published. Only four paradoxes are known and they come to us by way of Aristotle. Three are well known, but the fourth, the stadia, survives in an obscure form and is rarely cited as one of his more interesting paradoxes. It turns out to be most interesting. When we examine the literature devoted to the paradoxes we find dozens of major works written by renowned scholars from Plato to Bertand Russell. When we dig deeper into these works, we find a plethora of magnificent connections and attempts to understand their implications. The absence of Zeno’s writings warrants suspicion over whether or not the man actually existed beyond merely being a character in Plato’s Parmenides. Despite that absence, a great deal of extant material tells of his profound philosophical ideas and one can gather enough from them to assemble a more complete story, whether the man existed or not. If Plato and Diogenes Laertius can give corners to a kind of jigsaw puzzle of a life, and Aristotle and Proclus the edges for his philosophy, then we can fill in the rest. This book will discuss various implications and suggest the possibility that Zeno was arguing something deeper, namely that... well, perhaps you should read the book to find out.